January 1 is Independence Day in Haiti. 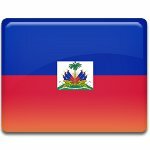 This date was chosen to commemorate the declaration of independence from France in 1804 and returning to Haiti its historical name. For a long time Haiti was a colonial territory administered by French and Spanish. The French Revolution in 1789 inspired the slaves in Saint-Dominique and the French West Indies to press for their own rights and free people of color. The Haitian Revolution began in 1791 and lasted until 1804 when the island got its independence. The most remarkable thing is that the Haitian Revolution was the only one slave uprising that led to the founding of a state. After the revolution and getting the independence Haiti wasn't recognized as the new republic by the President Thomas Jefferson, as well as the most of the European countries did. The official recognition of independent Haiti was made by France only on April 17, 1825, though the United States didn't recognize it until the Civil War. The Haitian Revolution turned out to be the defining moment in the history of Haiti. After the end of the revolution Haiti became the first independent state in Latin America, led by a person of color.